Before implantation, you need to thoroughly prepare your oral cavity with optimum hygiene. Our general recommendation is that you quit smoking at least for a while. Gingiva inflammation and diabetes must be actively treated. Any caries treatment must be completed before starting the implantation procedure. If by any chance insufficient volume of the jaw bone is identified, it will be necessary to perform a preparatory procedure of augmenting the bone mass. When insufficient volume of the bone tissue is identified, two options exist: either to give up on implantation or to augment the very bone so as to meet essential criteria for implantation and to satisfy the prognostic aspect. This procedure required by implantation is called augmentation. It consists of applying the patient’s bone tissue, some other material that acts as bone replacement or by combining the two. This results in physiological increase of jaw bones that can now handle the burden of implants. During this procedure, we usually recommend preventive antibiotics therapies as protection against potential infections and inflammations. First, we disinfect the oral cavity to eliminate risks of pathogen bacteria presence, and the rinsing is done with an antiseptic solution (e.g. chlorhexidine). Presumably, you have already started taking antibiotics therapy because infections and inflammations can result in implants falling out, i.e. they can lead to loss of implants. Preventive action is also recommendable in case of possible bacteria in the blood, the so called bacteraemia. Like artificial teeth roots, implants are placed inside the very jaw bone with the application of local anaesthesia. This treatment is intraosseus. It means that implants are directly built in into the bone. The planned spot of implantation (the mucosa) is cut, and the foundation is gradually adapted in accordance to the previous implantation plan and depending on the size of the spot dictated by implants. The processing is done by using a rotary tool – a drill, with a small number of revolutions per minute, and with constant cooling of the spot with physiological solution so as to avoid overheating of the bone due to friction. The next step is to place a stitch in the gingiva. The wound will heal within approximately 10 days and then we are ready to remove the stitches. Time required for the implant to become fully grown onto the bone is individual and primarily depends on the quality of the bone mass. To prevent injures, a temporary dental restoration is placed over the implant to give it functionality during this period of time. Average time of healing is between 3 to 6 months. 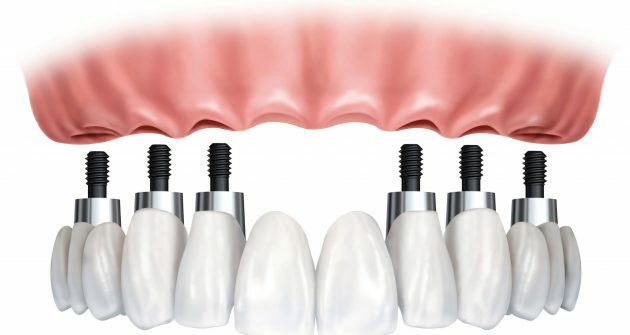 When the situation allows it, implants can be immediately exposed so as to bring about quicker growing in. The process of growing in of implants is invisible to the patients. It takes place under the gum mucosa. Then a second intervention is performed. 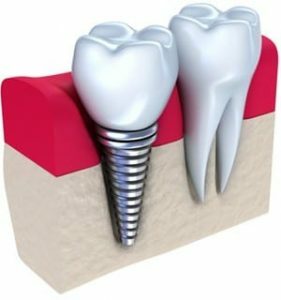 It involves exposure of the implant, connecting it with a permanent dental restoration. Further treatment includes placement of a supra-construction, a visible portion of the dental row. 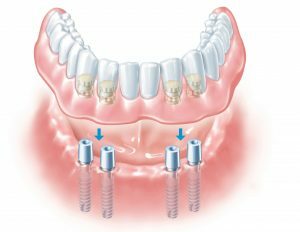 Implants are first processed and then, in a few simple stages, a supporting column is placed on top of them, as well as the abutment and a permanent restoration.